With 2008 starting with economic news of a down turn, The Queen of Ebay Meg Whitman Stepping down and breaking news from Apple I was starting to wonder how I was going to be able to afford more Technology Gadgets. Using Google I found lots of coupon sites, but nothing that really seemed legitimate. Most were more links to click on. I started on one site and clicked through 10 more before I finally came to the offer which was worthless. I found this one website called BigCrumbs. Its a social site really. People network to save and earn cash back from big websites like Ebay and retail sites like, Best Buy, Bed Bath and Beyond, and Gap. All you need to do is Sign Up for free then shop or refer friends. What the site dose is they have 1000's of Ebay Sellers Ebay Stores, and retail merchants in there data base. After you sign up simply click through one of the vendors and receive up to 36% cash back paid once a month through Paypal, Direct Deposit or check. You pay nothing to join. 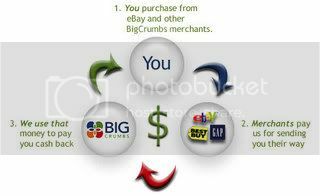 Ebay store owners and sellers along with name brand merchants pay BigCrumbs a commission to be listed in the data base. Intern BigCrumbs pays cash back to there members. Not only can you refer friends but you can refer friends from places like MySpace, FaceBook and other social networking sites. When you refer a friend and they refer a friend you get paid for that friends friend and so on. This is really a win win situation for everyone involved. Sign Up for BigCrumbs takes less than five minutes and you will be on your way to making cash back and earning money simply by telling others. Check it out. You won't regret it. It's worth every minute of you time. Don't forget to look for Magpie ! Sign Up For Ebay Here. It's fast free and easy. If you don't have a Ebay account yet you should sign up now.